Perhaps one of the most popular models of Ferrari's in recent years has been the 458 coming in a variety of special models; the Italia, the Spider and of course the rare and ultra valuable Speciale. When this 458 Spider arrived at Project Detail Sydney it was looking dull and the owner wanted the car rejuvenated and for us to reapply PPF to side mirror as it needed replacing and the original PPF job was done through another company. The overall paintwork had swirls and lacked clarity typical signs from regular washing but it was clear the owner cared about the vehicle. The car was optioned with a very striking combination, Nero Daytona Metallic paintwork with Gloss Black wheels and yellow brake calipers. While on the inside, it was bedecked with a gorgeous Beige leather option. The interior was slightly worn and had typical body oils and a glossy finish to the leather. We opted for our Full Swissvax Detail and Paint Correction Services, more information can be found by clicking the links. Luxurious Beige leather, cleaned and treated with Swissvax Leather Kit. The interior of the 458 is both luxurious and extremely sport orientated. Inspecting & Preparing the Ferrari. 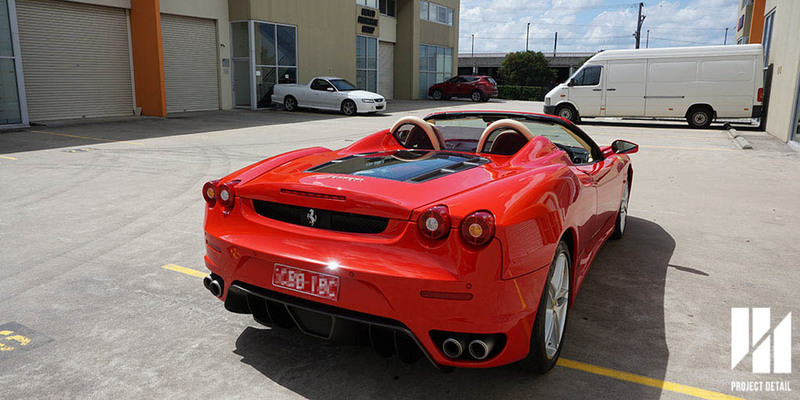 The Ferrari 458 Spider arrives at Project Detail Gladesville, Sydney. Project Detail inspects every vehicle thoroughly before starting the service. This hopefully detects any anomalies such paint chips, car damage or scratched wheels, anything that may concern the owner as early as possible. One of the standout features of the Ferrari the vehicle had general wear over all. It wasn't in bad condition but it definitely had not had any regular or standout detailing done in the time the owner had taken the vehicle. The exterior was dirty and there was contamination bonded to the paintwork. The paintwork also showed light to medium swirl marks and marring. The Interior was not dirty or soiled by any means but being beige leather, a slow build up of body oils, sweat and grim and begun to make the leather look glossy which is not what clean leather looks like. After inspecting and taking notes on the vehicles, the 458 Spider underwent our 21 stage washing procedure before it was ready for paint correction and further stages of the detail. Part of our 21 Stage Wash & Decontamination includes a luxurious Swissvax Foam Bath. 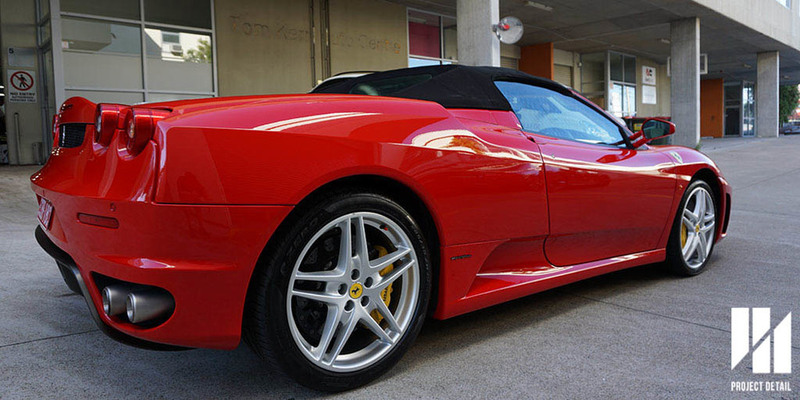 Swissvax products represent the pinnacle of car care and the results are oustanding. One of the major points of difference at Project Detail is the time we spend on each vehicle during it's detail at our Detailing Studio. We are fortunate to not work on too many vehicles per week as we undertake larger projects then most car washes or detailers, this allows us to be extremely thorough. Many detailers overlook the importance of the 'wash' stage and simply rush through this step. But a proper wash achieves two things other then a 'clean car.' By properly removing all dirt, debris and contamination, this allows the vehicle to represent it's true self when it comes time to paint correction. Secondly, by washing properly, it actually saves time for the detailer in an efficient manner as nothing needs to be redone or repeated. Project Detail still prefers the traditional Clay Bar. There are synthetic clay options, such as clay towels or clay pads but the best results we've found the clay bar gives the best results. Once the vehicle has been washed, decontaminated and thoroughly stripped of any waxes and sealants that may be on the surface, you will find that the water naturally clings to the surface. This raw paintwork has zero affect on water behaviour and would be easily contaminated by dirt of water spotting if left without any product. Without any products, pure paint will not sheet or bead water. The water will stick to the surface. 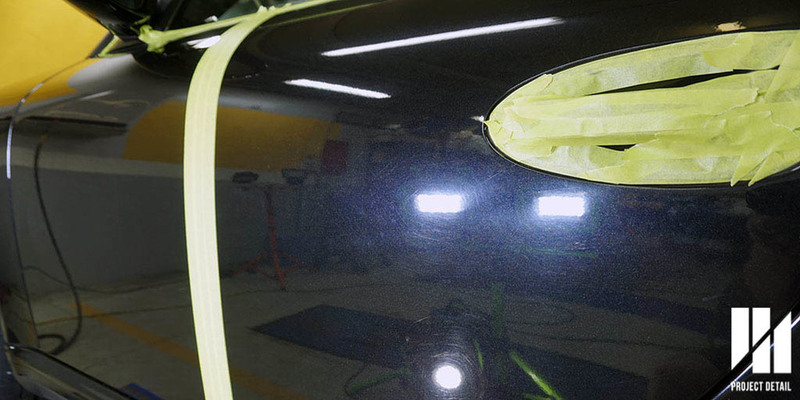 Once the vehicle was properly prepared for paint correction, the painstaking process begins polishing each panel individually to remove the defects that would be found on the paintwork. Project Detail uses the newest polishing methods and equipment such as the Rupes Bigfoot System and a combination of the modern style of abrasive polishes and compounds. Our Specialised detailing studio also has access to 3 scissor hoists. These allow us to work on the lower parts of the car with absolutely no compromise. This means a better finish for your vehicle. Without these hoists, many detailers need to lie on the ground and this makes it extremely difficult to get the optimum results. 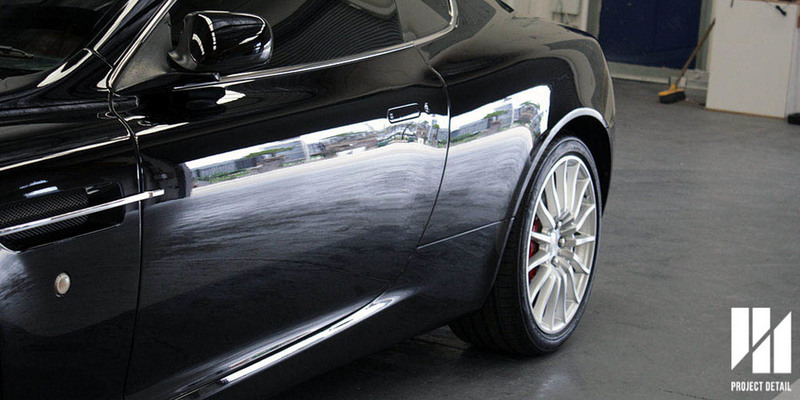 Our expectation is so high that if you have engaged us to perform paint correction, we will guarantee no holograms or buffing marks in the paintwork. But depending on the level of paint correction, we can remove differing levels of defects and scratches in the paintwork. Rear Bumper - Before Correction. Rear Bumper - After Correction. 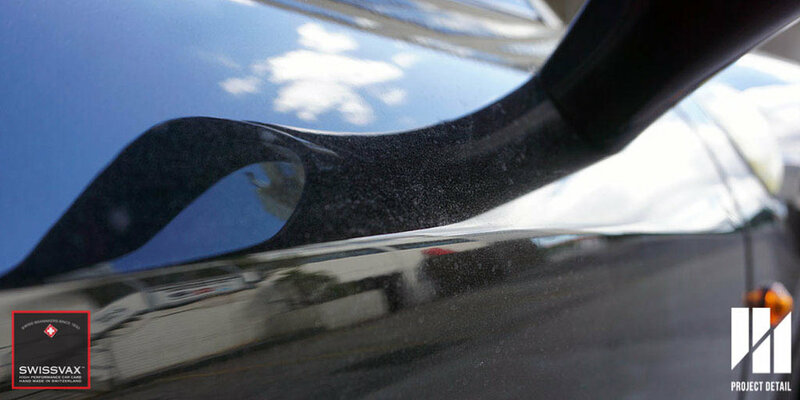 Paint correction depending on the type of vehicle or the level the client has engaged us can be a very timely process. Usually taking up to a whole day and easily taking several days to complete. The reason for this is to get the best finish, multiple stages of polishing is still required. There are many products which some detailers (and even us on the situation) which are claimed to be 'one step' polishes. These marks a major advancement in technology but still lack the refinement of a multi-stage correction. The Rupes Bigfoot system is also made in Italy. It's good to see Ferrari and Rupes work together. 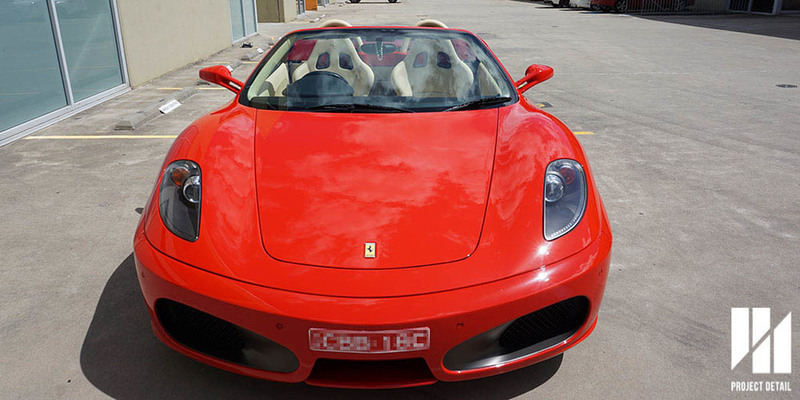 Swissvax Scuderia - Specially designed for softer Italian paintwork. Once the paintwork on the 458 Spider was refined and we were happy, the paintwork was then wiped down with a diluted ratio of IPA. This removes any final oils left over from the paint correction compounds and polishes. This also allows one final inspection to make sure we are happy with level of paint correction. Because the owner opted against applying a glass coating on the paintwork, we chose the best wax suited for the task of making the cars paintwork standout. 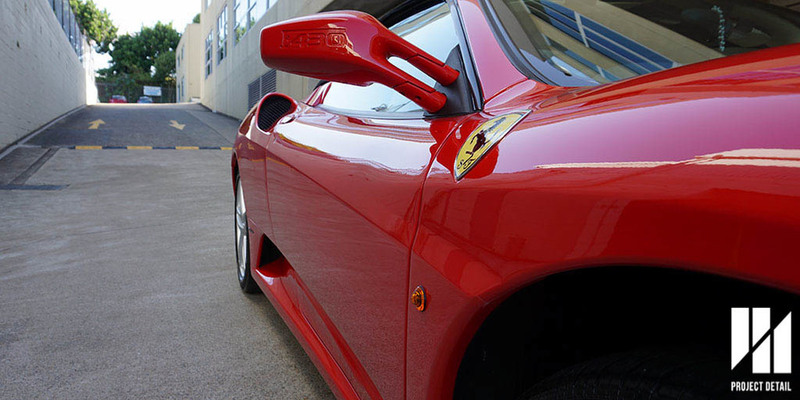 Swissvax's Scuderia is a handmade and hand poured wax manufactured in Switzerland. 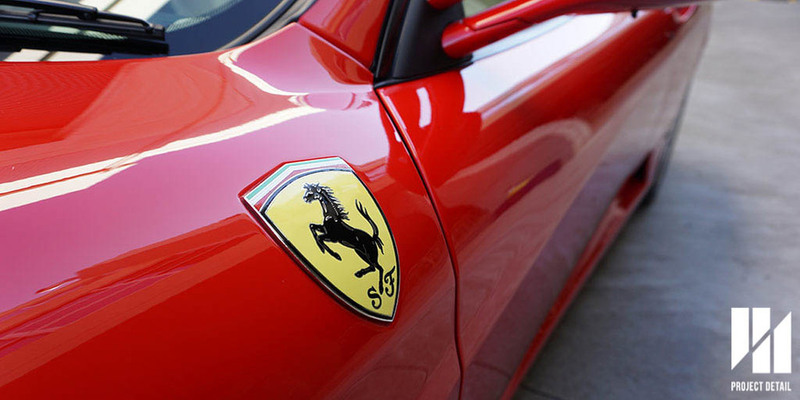 With a special blend of fruit oils, carnauba palm wax and other ingredients, Scuderia is specially designed for the softer paintwork on Ferrari's, Alfa Romeo's and Fiat's. We apply this thick paste wax literally by hand. A small portion is massaged into the palms and slowly and gently applied over the paintwork. It may look like a mess, but the hand application allows a thicker and more even layer of wax. With high quality waxes such was Swissvax, the wax must be allowed to cure and bond to the surface. In this instance, Scuderia needed 2-3 hours before it began curing and bonding otherwise it would still smudge and not protect the paintwork properly. 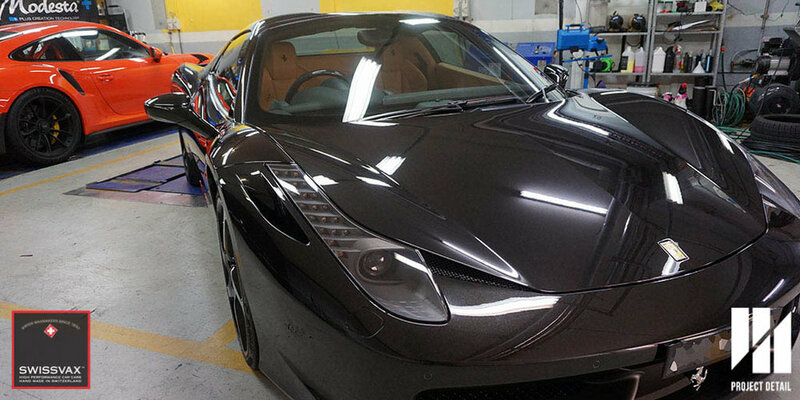 During the long curing time for the wax, time was taken to finish the other parts of the 458. In particular, the client requested us to redo the PPF Film applied to the mirror as the older film (applied by another company) was lifting and required fixing. Replacement of original PPF with specially designed kits. Even freshly applied, the new PPF looks superior to the old film. It was during this time, we wanted to highlight the issues with the existing Paint Protection Film applied on the vehicle. Rather than using a properly designed kit which is cut with a plotter, the application has been 'bulk fitted' this means that the PPF was applied in one large piece and completely cut by hand. While this method is acceptable for areas like bonnets, more complex areas like the front bar and especially on a vehicle as complex as a Ferrari 458 Spider, there was a large amount of seems and joins versus a properly designed kit. Both sides of the front bar have a large amount of seems and joins. The worst part though is the more you cut by hand, the larger the chance there will be cut lines on the paintwork from the blades used. In order to decreases this risk, proper kits should be used in order to maintain both the paintwork and achieve the best finish in safe manner. We also gave special attention to the wheels of the Ferrari, while normally we would remove and apply a coating such as Modesta BC-06 to the wheels, the wheels were cleaned and treated with Swissvax Autobahn Wheel Wax. This is a wax with a special concentrate of PFTE (Polytetrafluoroethylene) which is more commonly known as Teflon. This provides a slick and heat resistant finish to the wheels which allows easier cleaning and a nice glossy finish for a short period of time. While a wheel wax is fantastic, the heat generated from the brakes and wheels from driving greatly impacts the lifespan of the wax. Project Detail recommends Modesta BC-06 for Wheels and brakes as it is highly resistant up to 1,300 °C. Once the wax was cured, wiping off the excess is always exciting to see the level of finish underneath. The richness and depth of wax is still something that is mind blowing to this day in an era of coatings. If you would like your vehicle rejuvenated with Swissvax or would like to protect your vehicle with an exclusive coating like Modesta, contact Project Detail to start a discussion on how we can assist. 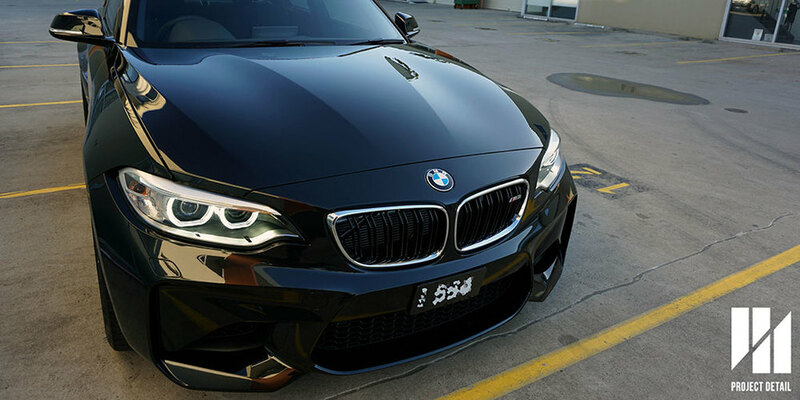 Project Detail was fortunate enough to detail and protect one of the first BMW M2 Coupe's to be delivered to the country. Painted in beautiful Sapphire Black, the newest M Division car certainly doesn't disappoint on any level; performance, looks and quality. 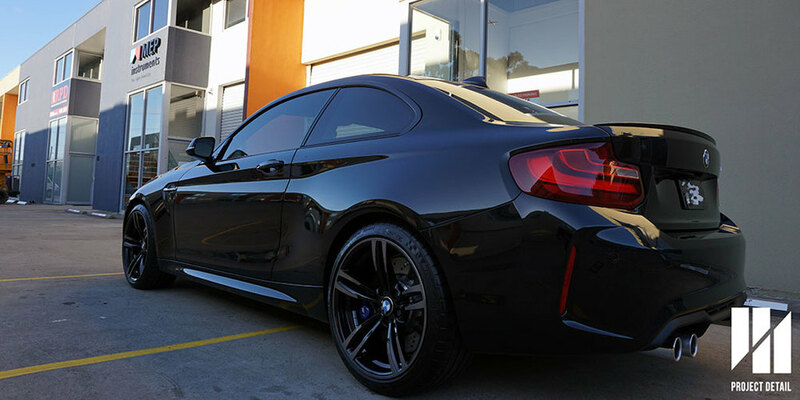 Striking BMW M2 in Sapphire Black finished with CS2 Titanium ceramic quartz coating. For the M2, the customer wanted give the car the best protection possible in order the preserve the looks after with finished the paint correction process. We spent a total of 3 days working on the vehicle, beginning with our 21 stage wash & decontamination and the 2 stages of paint correction. After we were happy with paintwork, we applied CS2 Titanium ceramic quartz glass coating to the paintwork. We also coated the wheels, brakes and the windscreen with CS2 range of protection products. Deep cleaning arches, wheels & brakes. Coated to enhance and preserve. Finer details normally missed by most. Wheels & Brakes full protected. The CS2 Titanium took 8 hours overnight to fully cure before it is water contact ready. 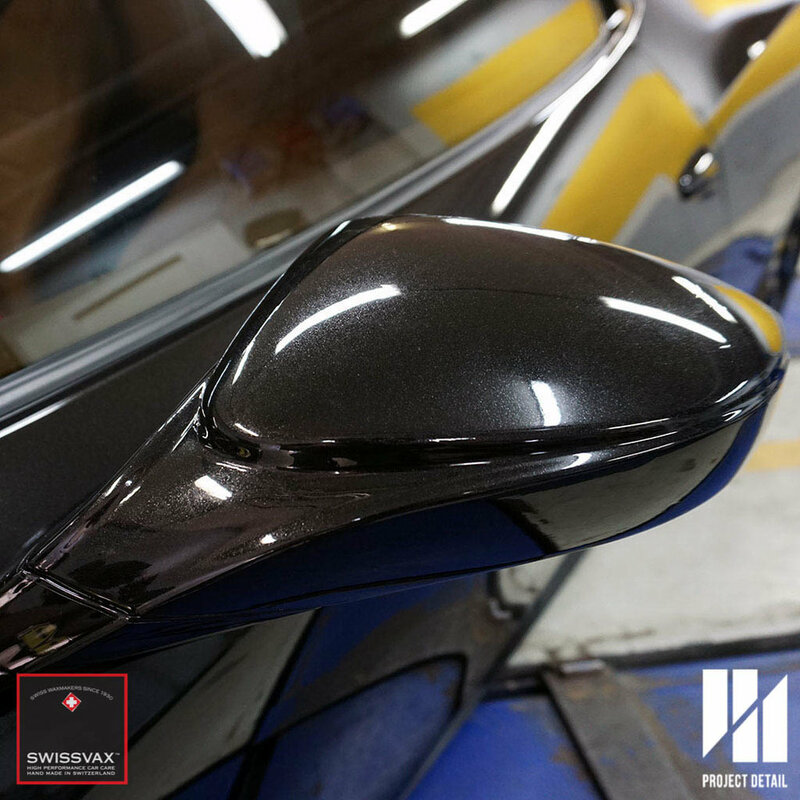 In that time we finished detailing the last components such as polishing the exhaust tips, coating and protection the interior and applying CS2 Clearvue to the exterior windscreens. CS2 carries a wide range of interior coatings that allowed us to protect the leather, vinyl, matte carbon finish and also the upholstery. We were very happy with the results and the client was extremely satisfied when he received his car. Overall, the car took longer than usual due to the hard ceramiclear finish on BMW paint but the results speak for themselves. For more information on CS2's range of protection products click here. If you would like Project Detail to work on your vehicle or have any enquiries, click here to contact us. 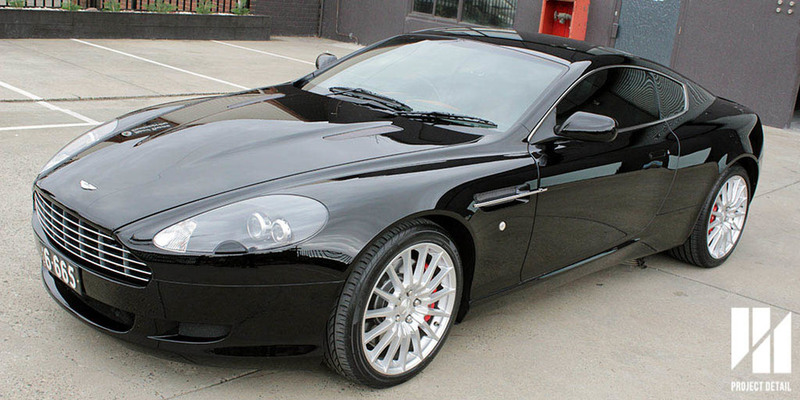 Our Project Detail Melbourne Studio recently restored an iconic Aston Martin DB9, performing full paint correction and applying CS2 Ceramic Glass Coating to finish. Our loyal client recently has purchased this car from a dealership and before it was delivered, unfortunately it was handed to their team of detailers and they did not do a very good job. Not excessively dirty but still requires cleaning. A Quality Iron Remover in Action. From a distance, it certainly looks great because it has been freshly waxed from the dealership. Wax temporarily hides imperfections, also wax gives a very warm carnauba finish. Especially on black cars. But however after it went through our 21-Stage Wash and Decontamination, the true finish of the car started to show. Swirl marks and holograms showed up. For every car that comes into project detail, we use latest techniques and polish thoroughly using combinations of fluorescent, halogen, LED and sunlight to properly and safely remove imperfections on your paintwork because certain setting of lighting are able see certain imperfections. Using the combination of all, we are able to view the actual condition of the paintwork and take the right approach of polishers, pads, chemicals and technique. 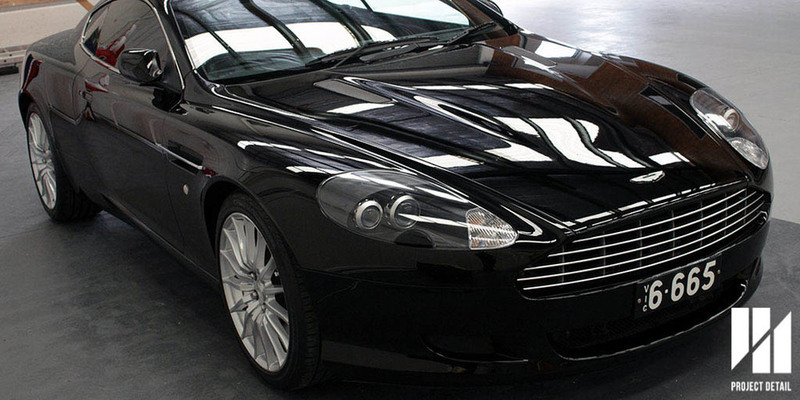 For this Aston Martin, it went though a combination of Stage 1 and Stage 2 Paint Correction. 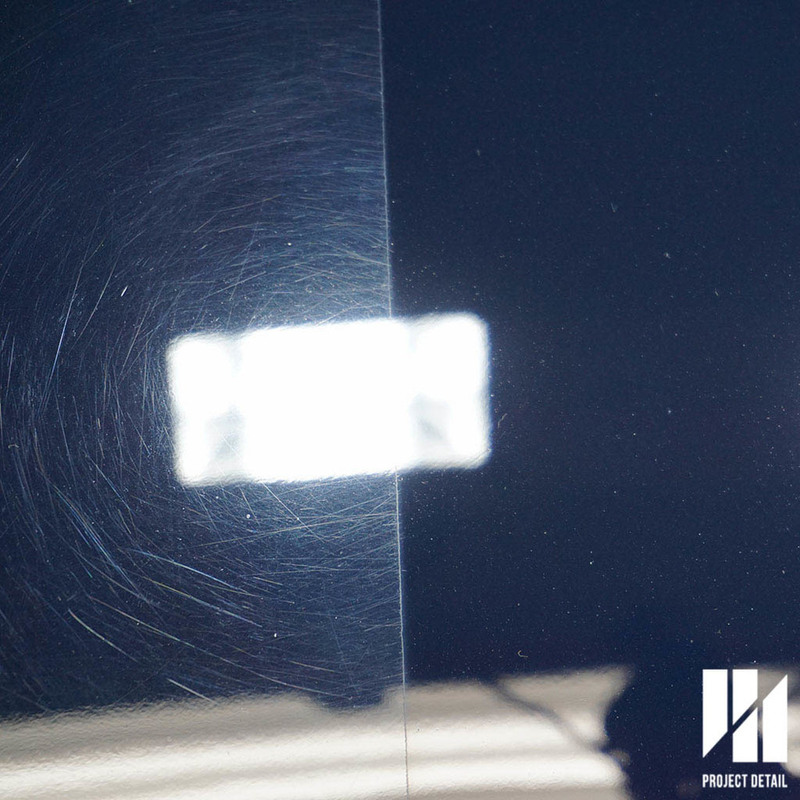 On some panels, the defects are bad while on some panels they only require a Stage 1 Paint Correction. We took 15 Hours to complete the paint correction process to reach to the level where we are happy with it before starting the CS2 Ceramic Application. Final Results are phenomenal, even every time we stand back and look at it, we are genuinely impressed by the results! More information about CS2 Ceramic and paint protection coatings can be found here. Looking to get your car detailed? Feel free to get in touch with us by clicking here. 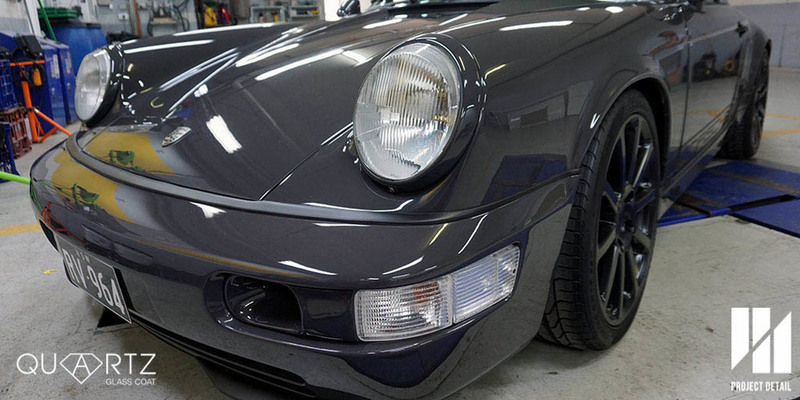 We seem to be biased towards Porsche car detailing at Project Detail, while that may or may not be true, it is undeniable that the 911 has been an icon for the Zuffenhausen Company. In fact, it has been argued that the shape has very much become a 'brand' in itself that represents the precision behind Porsches success. 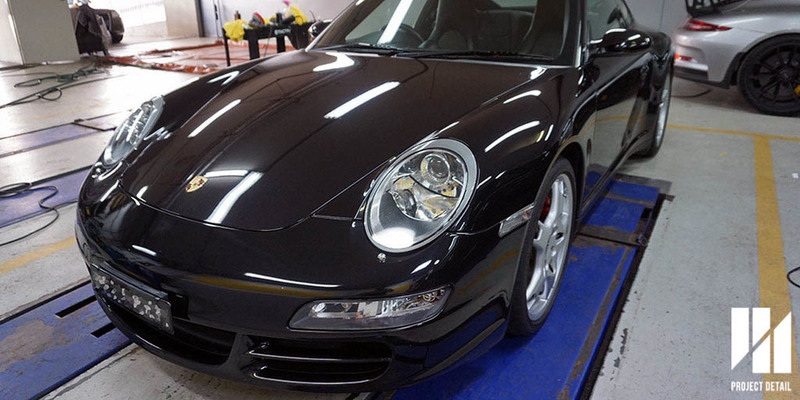 We spent over a week working on this Porsche 997 911 Carrera 4S. The new owner had commissioned us to restore the interior, wheels, engine and paintwork to the highest degree. To illustrate just how much time we spent on this particular Porsche, we've decided to make this article a bit longer then than normal. Thank you and we absolutely appreciate your patience in reading and viewing about our work. Please be patient to allow photos and all galleries to load. 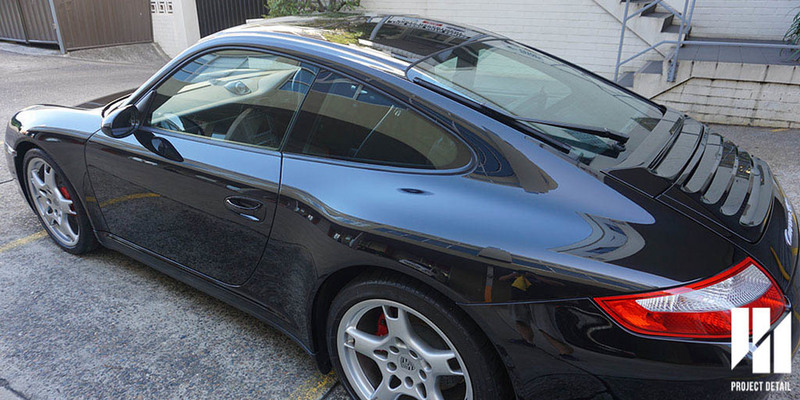 The 997 911 Carrera 4S, glossy and finished outside our Studio in Gladesville, Sydney. As with most Porsches, they strike an emotional chord with their owners that seem to see them adore and wanting their cars looking their absolute best. This particular 911 Carrera had been washed incorrectly in its lifetime which unfortunately meant the paintwork was extremely dull and was covered in medium to heavy swirl marks and other paint defects. 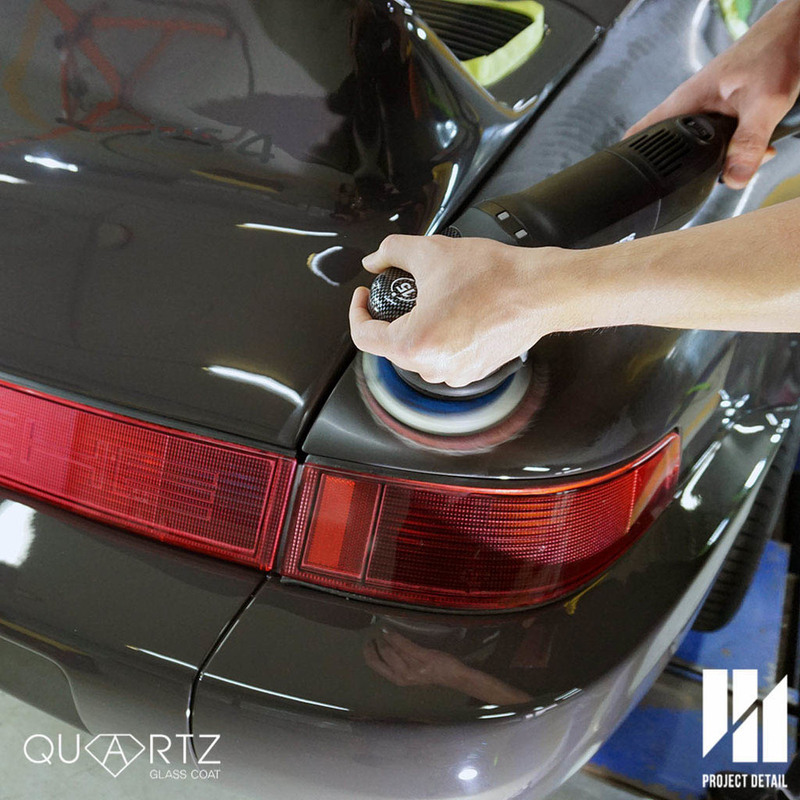 Like all the Porsches we have worked on, they require an incredible amount of time in order to polish all the curves and make sure the hard German paint is corrected properly in order to show the real colour of the car. In order to begin the process of detailing any major project, we need to be able to assess the vehicle thoroughly in order to decide how to appropriately approach the car. Our 21-stage wash is already drastically different from most car washes or even some detailers. It includes the use of a citrus pre-wash soak, Iron Ferrous Remover, snow foam, multiple grit guard buckets and the luxury of hot water. Before - Wheel has moderate brake dust. After - Iron Remover reacting to brake dust. After the wash the vehicle is then decontaminated; Iron Fallout, Tar, Tree sap and other contamination is removed from the surface. This contamination cannot be removed during the wash process. Project Detail Sydney & Melbourne uses a mixture of Microfibre drying towels, Waffle weave towels and air blowers to dry the car after the wash. This way, no water is still present during inspection and especially during the paint correction phase. Only once the vehicle is washed, decontaminated and dried properly we can begin assessment of the vehicle. 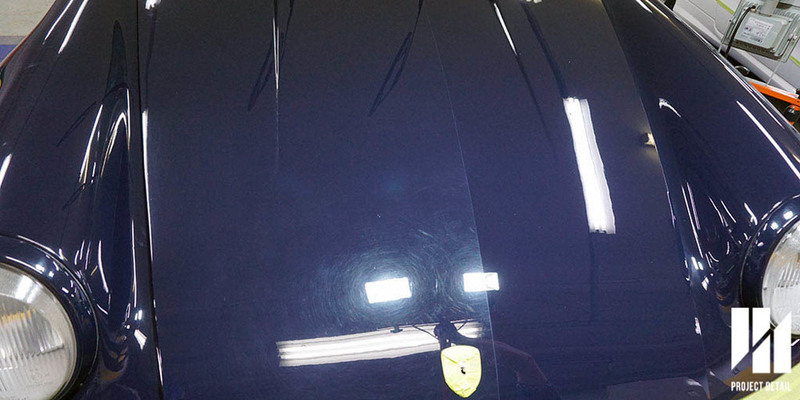 This way none of the dirt, dust or contamination can affect the appearance of the paintwork. The inspection is done under a mixture of LED, fluorescent and halogen lights in order for us to see all the scratches, swirl marks and paint defects and make notes regarding the car as we progress. The photo's in the gallery illustrate the poor nature of the paint beforehand. 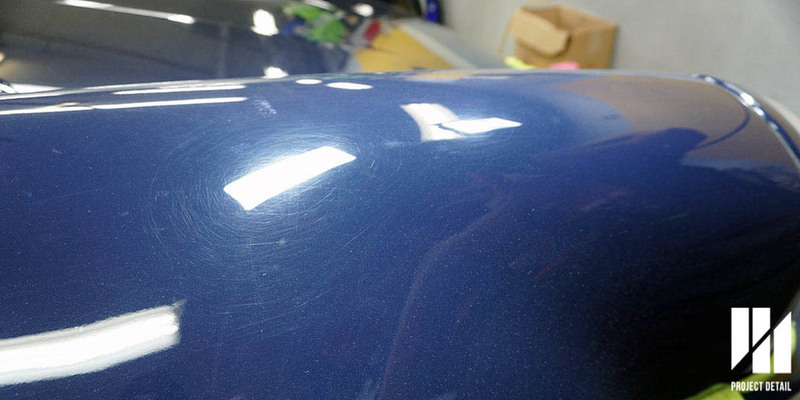 Heavy Swirl marks were consistent and present all over the paintwork. The paintwork itself was dull and lacked clarity and depth. 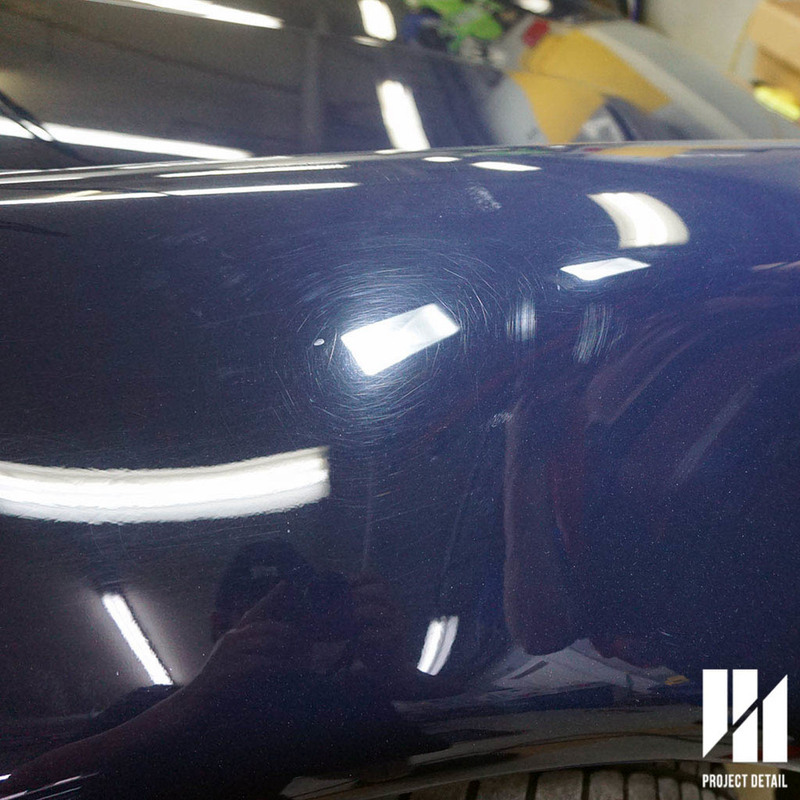 In order the rectify these issues, we needed to proceed with intensive paint correction to remove all the defects and bring gloss back to the car. 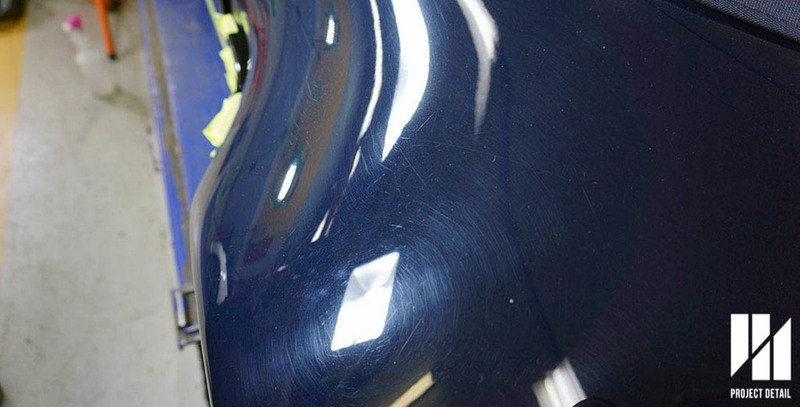 Paint Correction is the technical term Project Detail uses to describe the machine buffing and polishing process. Paint Correction is a time consuming task which often means it can can day and sometimes weeks to achieve the perfect finish. 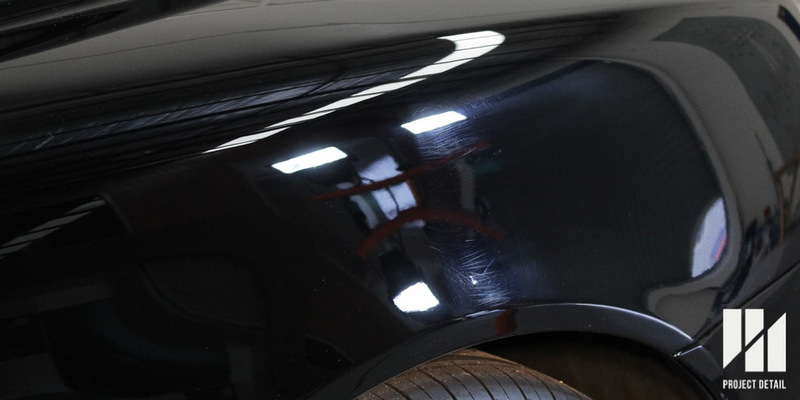 To find out more about Paint Correction, click here. 50/50 shot - Passenger side door. The left side original & the right side is after paint correction. This polishing process involves using a series of machines which slowly polishes the surface using abrasives which flatten the surface until the defects disappear overtime. From the photos, the depth and metallic flakes really begin to stand out. The metallic flakes and colour can clearly be seen in the paintwork. Passenger side after correction begins to show mirror reflections. 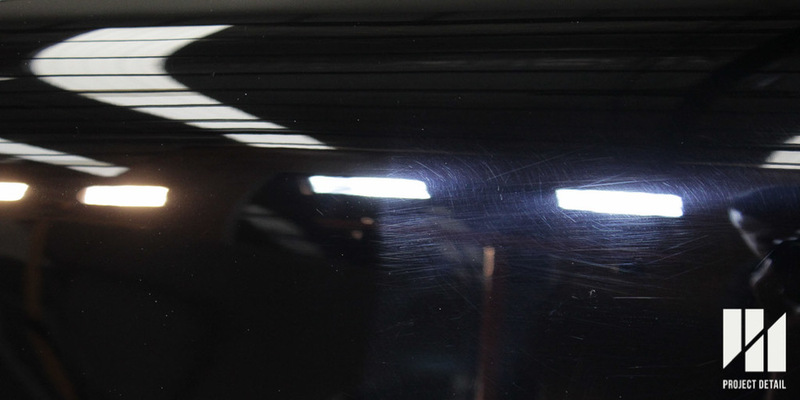 Paint Correction begins with a more aggressive product called a compound, these contains abrasive materials which allow us to remove the swirl marks and scratches. This process can take hours depending on the severity of the defects and also the hardness of the paintwork. 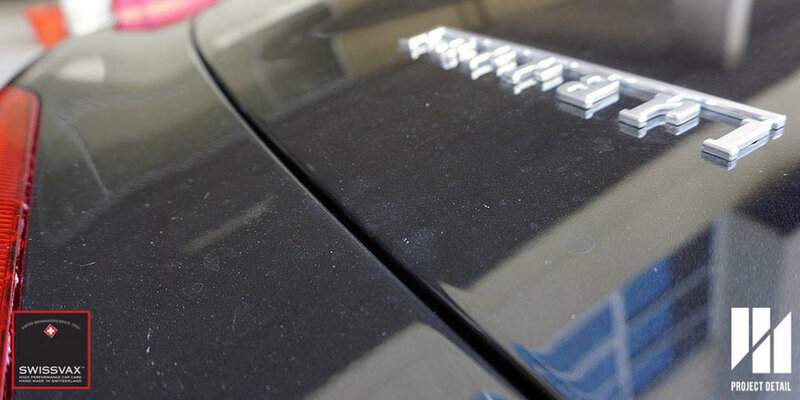 For example, most German cars using extremely hard paintwork versus the soft spongy paint from Japan. Because Project Detail specialises in the correction of high end vehicles, we have access to a variety of tools which allows us to work in finer areas which would be out of reach normally. Our Rupes TA-50 is a team favourite, allowing us to polishing the smallest areas with ease. Smaller & Finer areas are no problem at all. Rupes TA-50 polishing the smallest areas. Using the right tools for the job. After the first stage of compounding, the paint correction continues to move towards refining the paintwork with finer polishes with more delicate abrasives. These allow the paintwork to begin to take its glossy finish. The fine polishes also allow any haziness or dullness from the first stage to be removed. 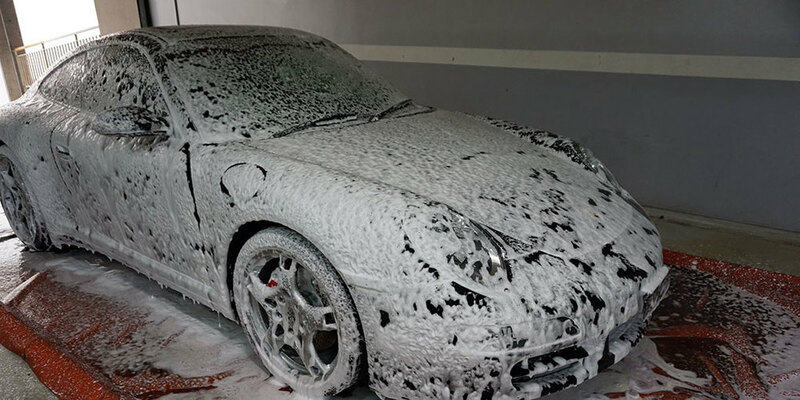 The Porsche is then washed a second time to remove compound dust and debris that naturally collects during the paint correction process. This also gives the chance to clean rubber seals, remove masking tape and prepare the car for the application of the glass coating. The defects and the swirl marks are now permanently removed. They will only return in the form of new scratches but with the right protection coating and care the car can stay looking great for a long time. The vehicle then undergoes one of the final procedures. CS2 Titanium is a top tier, 2 part glass coating which gives great physical resistance, superior water beading and an intense gloss to the car's it's applied to. The curing time varies depending on the weather but normally we allow 7-8 over night to let the product become ready. The final elements of the detail are finished at this stage including, any wheel detailing or coating, exhaust polishing etc. This Porsche also had it's interior detailed and also the wheels removed and coated giving it the long term protection it needs. We hope that this longer article shows some of the work that goes into preparing the detailing these beautiful vehicles. Project Detail strives to deliver the best results for their owners. 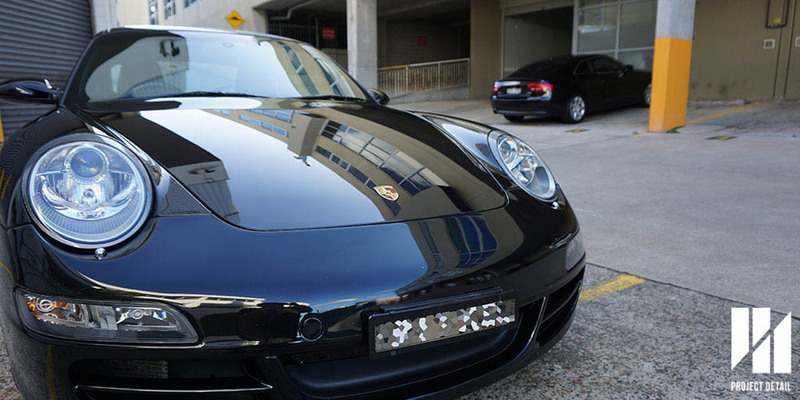 This Porsche 997 911 Carrera 4S looked remarkable when it was finished. The owner was stunned at the level of gloss that we could achieve and the paintwork looked completely different to when we began. We have the pleasure of regularly maintaining this vehicle for the owner. 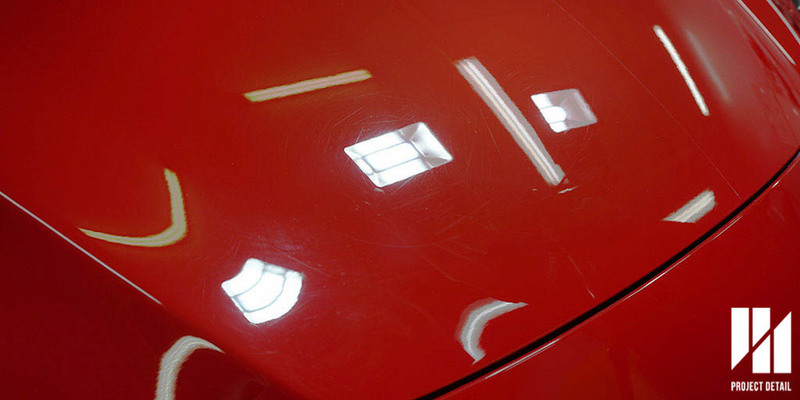 This means that we can check on the coating's condition as well as dealing with any swirl marks or scratches that may develop in between visits. 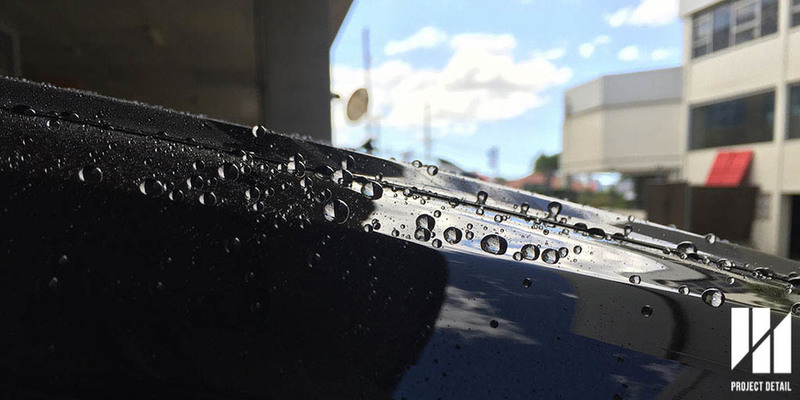 CS2 Titanium Glass Coating - Notice the intense water beading during a regular wash service. A Ferrari is always a special occasion to a detailer. In Sydney, we are fortunate enough to be able to see these works of art come by occasionally. 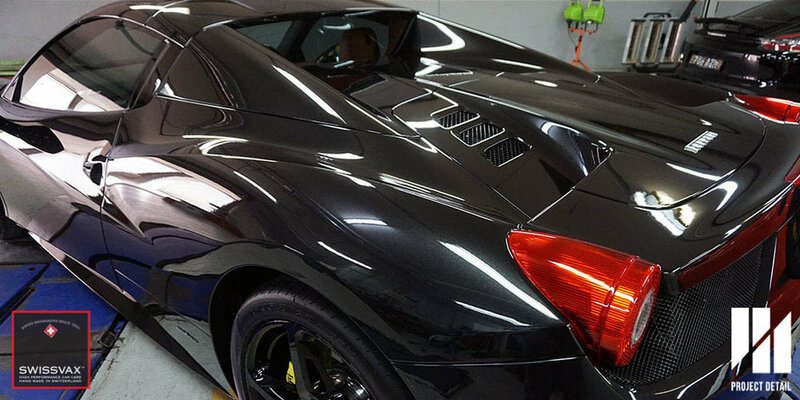 Project Detail's specialised detailing workshop allows us to perform customised services for supercars and specialised vehicles alike. Project Detail is located in Gladesville, near Hunters Hill which is accessible to most of Sydney. Our 3 vehicle hoists allow to detail supercars that may be hard to detail due to their height or requiring removal of wheels that are very expensive. We also utilise a hot water pressure washer, allowing us a more thorough wash that cannot be achieved without one. 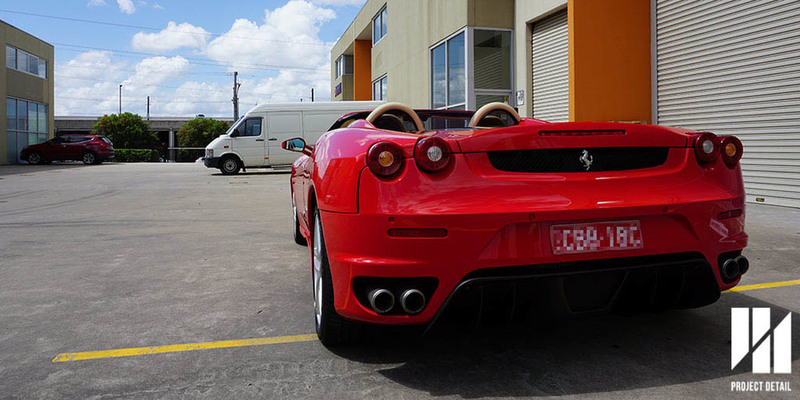 Project Detail is aiming to provide your car with a service unmatched in Sydney. Our goal is to make these cars look amazing, allowing their busy owners to smile when they take time from their busy schedules to drive these cars they have worked hard for. If we can achieve that, then we have accomplished what we aim for which is beyond detailing. The wash, decontamination and prep takes hours before any polishing even begins. Our work on the F430 took us a whole week to complete before we were satisfied before presenting the car to the customer. The existing paintwork was mediocre condition. It was cared for by all of it's owners, however the paintwork still needed 2 stages of polishing in order to remove all the defects. The soft nature of Ferrari paintwork meant there was a lot of consistent swirl marks and 'random isolated deep scratchs' or RIDS. The paintwork also showed signs of light oxidisation which is perfectly normal for the age of the car and also being red paint. Surprisingly the interior was in good condition, the leather was slightly dirty but the two parts that were worth noting about the interior include the black rubber coating for all interior buttons and the carbon fibre on the back of the seats. The owner did not want them removed, so polishing them properly was impossible. For the paint correction required an extensive 2 stages, this was painstaking as we made sure we polished all the contours, small vents and only on the hoist were we able to polish the low side skirts properly. We used a combination of Rupes polishing machines and Scholl Concept polishes which are manufactured in Italy and Germany respectively. This allowed us to produce the top tier results we were after. One important element often overlooked by carwashes and detailers is the requirement to have quality tools, chemicals and products. Just like the Ferrari, Lamborghini's or Porsche's quality can only be achieved sometimes with a higher cost. We do not compromise at Project Detail, only the focus of quality is important. 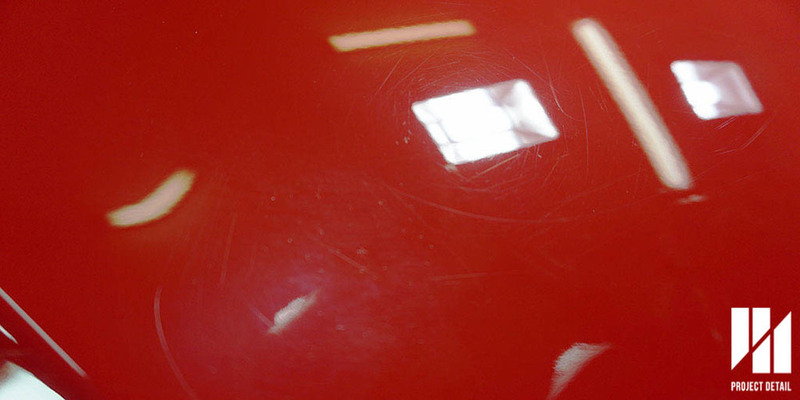 A particular nuisance areas of many convertibles or Spider supercars is the rub marks left behind by the soft top sitting on top of the paintwork. Fortunately with the right tools, these can be polished and removed revealing the glossy original paintwork. 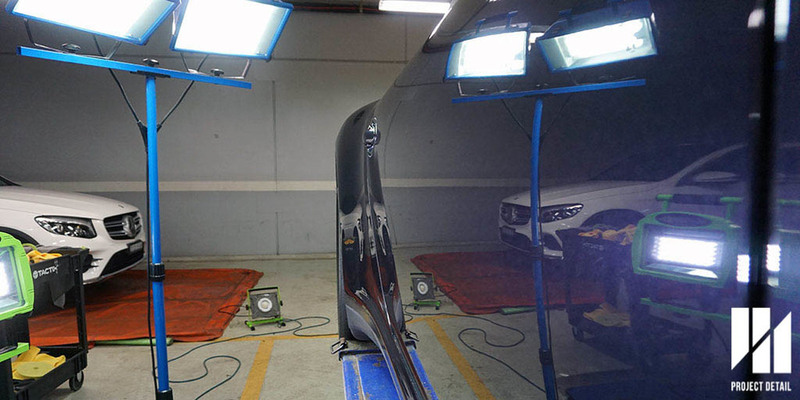 After correction, the vehicle was coated with CS2's Black Edition coating. 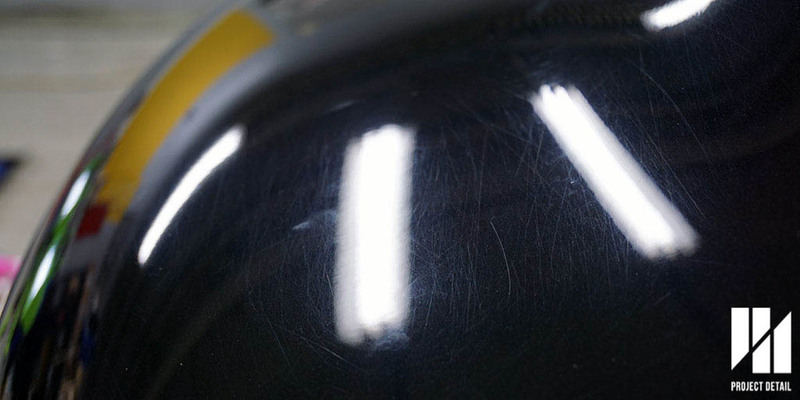 Black Edition is a bespoke coating that is only created for specific detailers in each country. Project Detail is privileged enough to be able to apply this to only to the best cars and where the customers demand the best. 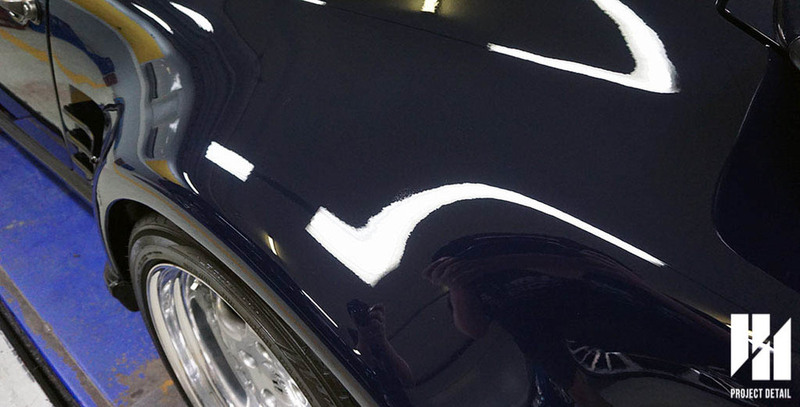 2 Stages of paint correction & a quality glass coating can achieve unbelievable results. CS2's Black Edition is a very difficult product to apply, however the results are outstanding. It has an extremely high percentage of SiO2 (Silicone Dioxide.) The gloss is undeniably deep and wet. The long term benefits become apparent to the owner as after each wash, the car looks freshly detailed. The coating beads so aggressively that the water literally falls off the surface, these attributes allow the car to preserve it's looks and look extra special when these busy owners take them for a drive. 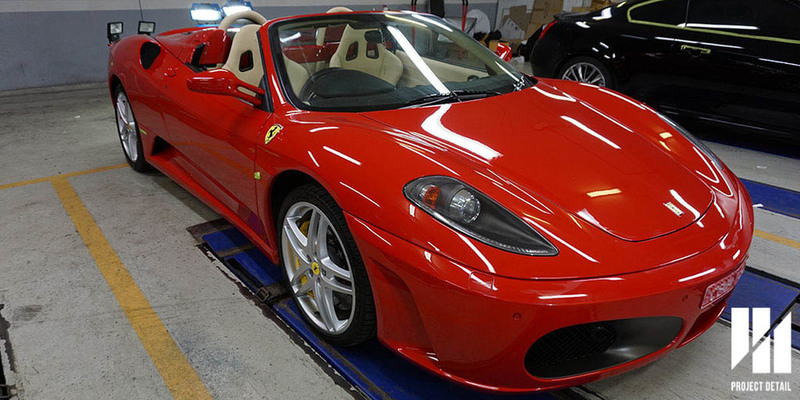 This Ferrari F430 definitely is one of our most memorable cars we have completed to date. The owner allowing us to go the extra mile is motivating and seeing their reaction when picking up the car is memorable. If you care for your vehicle and demand the best, consider contacting us and organising a time for us to discuss what we can do for you. The finished result on this Ferrari F430 in Rossa Corsa was superb. Where do we begin with this car, amongst the Sydney and Australia Porsche scene this car if renowned for the time and effort that has gone into building and creating this car, being featured on Speed Hunters and built by Autohaus Hamilton in Brookvale. With the value on air-cooled Porsches increasing every year, this 964 911 Carrera RS-4 can be considered a work of art. Every element of this car has been customised, the paintwork 'Black Grey' was coveted colour choice for the 997 911 GT3 RS released between 2006 and 2011. The Brake Calipers are Bright Green, the wheels are Satin Black. There are way too many details to mention and not forgetting the engine which has a had enough work you could buy a new Toyota Camry. If you are interested in the work behind the build and creation of this beautiful Porsche, the following links are some articles you can read about it. Project Detail was fortunate enough to have the opportunity to detail this much loved machine to its peak condition. 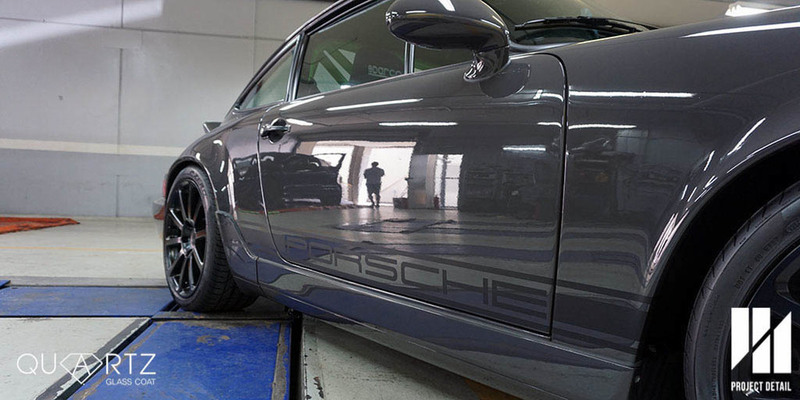 We would add our passion into this vehicle, meaning everything from the mechanic to the owner and now us, the detailer would be applying the utmost car for this Porsche. The owners allowed us correct the paint as much as possible with the exception of wet sanding. This meant that everything with the exception of stone chips (from spirited driving of course) and the orange peel in the paintwork would be removed. Even though the car had been cared for, the paintwork and finish were missing a detailer. The paintwork required more then a 2 stage to make the flat 'Black Grey' as glossy and defect free as possible. 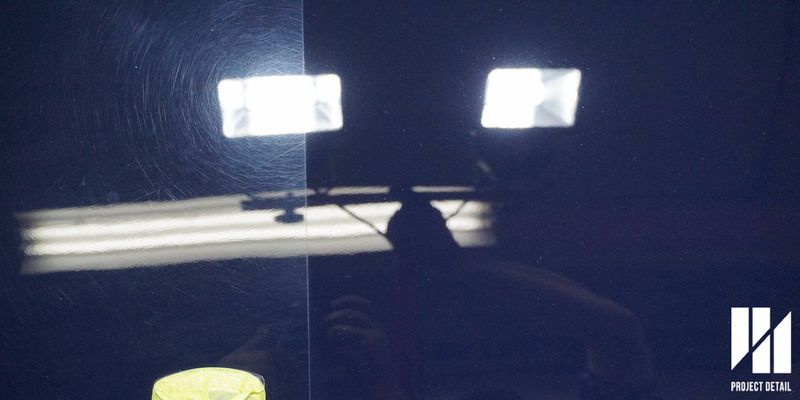 The car's paintwork would be protected with TAC System's Quartz Sparkle 75% Glass Coating. The wheels and Calipers were coated with Quartz Magic Wheel & Brake Coating. The end result after 2 stages of polishing and applying Quartz Sparkle Glass Coating. 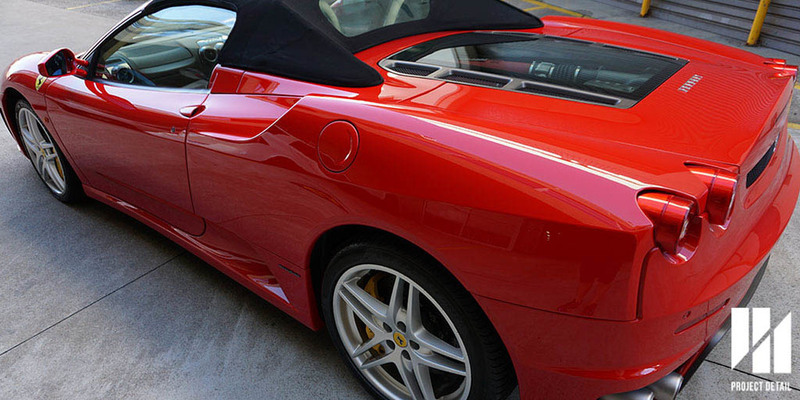 Using Rupes Italian Polishers, paintwork is polished to a high gloss. 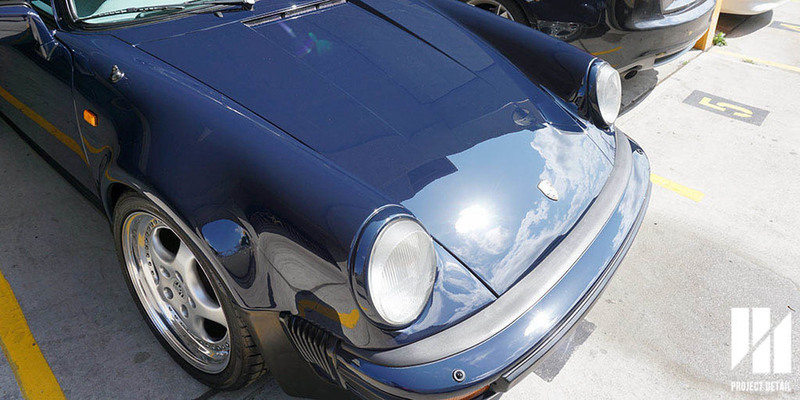 From the extensive correction, to the custom interior detailing and finally applying and curing the Glass Coating for protection, this Porsche took Project Detail an entire week to complete. We only use the best and relevant equipment and chemicals to obtain the results. This car was polished using the italian made Rupes Bigfoot polisher and the German made Detailing Kingdom compounds and polishes. The grey colour is a unique colour as it appears very flat, but once all the defects are removed the surface becomes extremely glossy. After applying Quartz Sparkle, the surface is superior to all but the best waxes. 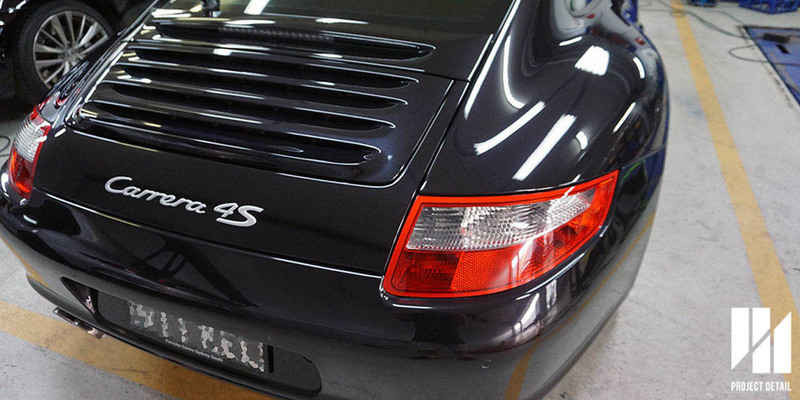 Project Detail Sydney loves detailing classic sports cars, at the apex of that category are Porsches. Porsches tend to be a polarising car. Most of the customers we speak to usually completely detest them or they actually own a Porsche. Having said this, one thing we definitely respect and some of us here completely love, is the Porsche owners passion and knowledge for their car. 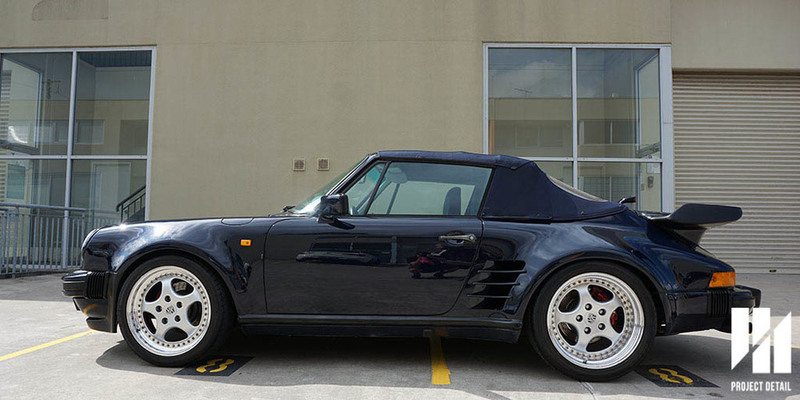 Due to the age of the vehicles versus the amount of affection given to these vehicles, Porsches from 1997 and earlier tend to greatly benefit from extensive detailing due to most of these vehicles appreciating in value. 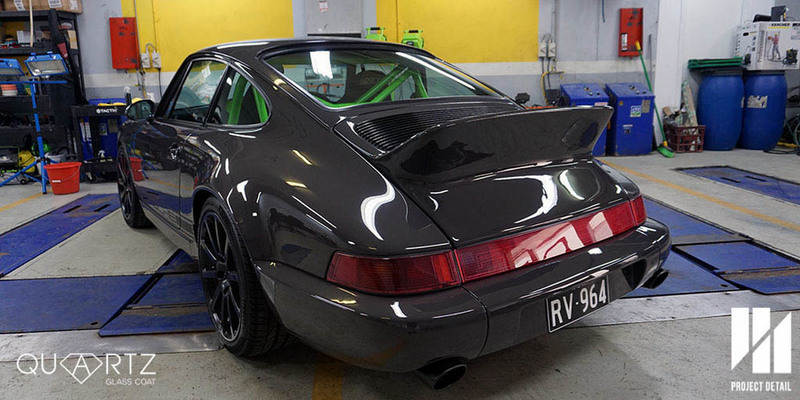 We can proudly say that we have detailed a 1997 911 Carrera 993 in the past and after extensive paint correction on the original paint the owner confirmed it went up in price after having the car valued. 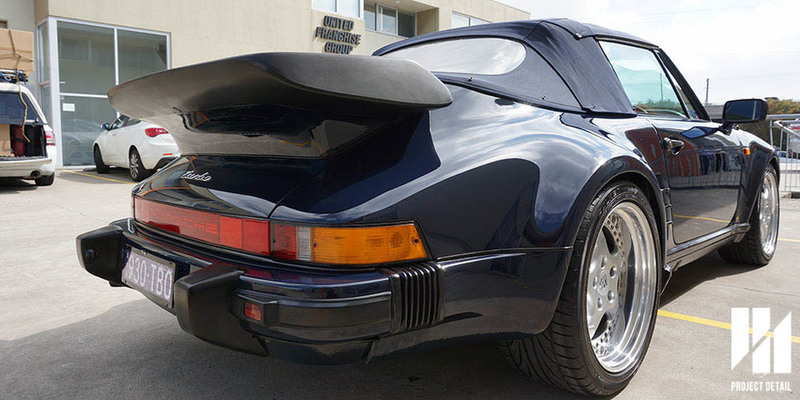 This timeless 1986 Porsche 930 came in looking like a classic. The paintwork was dull, lacked clarity and after inspection the paintwork had medium to heavy defects. Swirl marks, marring and deeper scratches were all present all over the body. Swirlmarks & Scratches all over body. Project Detail took an entire week to work on this car, giving it a bespoke service tailored to the customer's expectations. Every aspect of the car was extensively corrected and polished given the state of the paintwork. Project Detail has specialised tools in house that allows us to polish even the finest and smallest of areas. This gives the car an even but astounding result as no part of the car is unpolished. The paintwork was coated with CS2 Black Series in order to provide a superior level of protection versus any other coating on the available. The customer was kind enough to spare no expense so we reserved and produced the best results for the client. We love the feeling when we are also so impressed with a car that it gave us goosebumps. From the before photo's showing heavy swirls to taking photo's in the sunlight where the cars paintwork was mirror perfect, this was an memorable car for Project Detail. Project Detail Sydney can help protect your new car with the very best detailing methods and protection products available on the market. 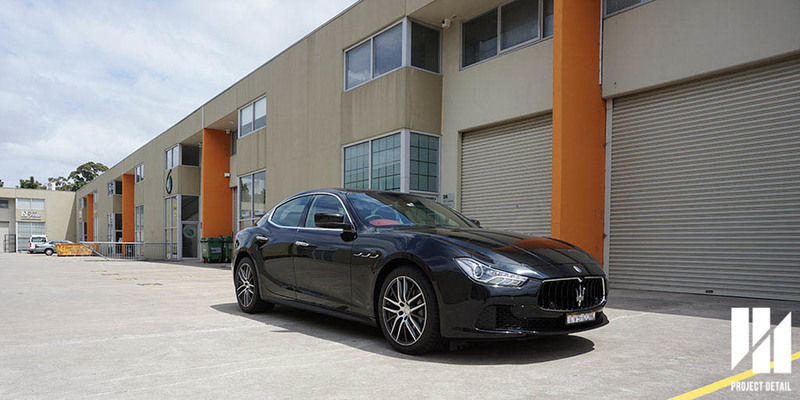 This 2015 Maserati Ghibli was brought to us one month after it was purchased. 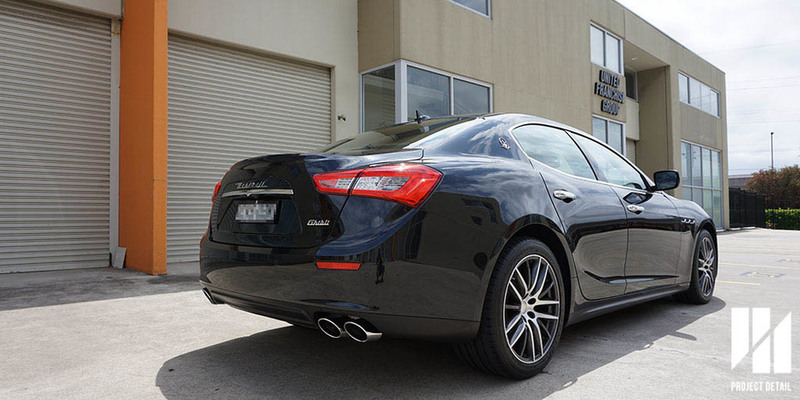 Fortunately for the owner, it looked like the Maserati dealership and any person who washed his car in the interim were delicate and used proper washing methods, there were very few swirl marks and no marring scratches on the body of the vehicle. 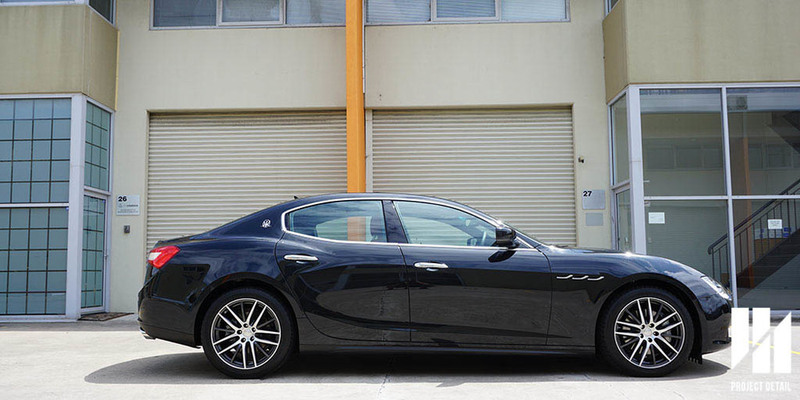 In order to produce the best results for our clients, the Maserati Ghibli still underwent a Stage 1 Paint Correction. In this instance, rather than doing any cutting, we focussed more on polishing and getting the paintwork to be as glossy as possible and have as much depth as possible knowing that whichever coating we applied would magnify this effect. The customer ended up choosing CS2 Titanium. With confidence, we can say this is one of the world's most advanced glass coatings. This coating come's in two parts allowing it to achieve a thickness that is unmatched by many other coatings available and giving the car an extremely high gloss and water beading ability. The final results for the Ghibli were absolutely stunning. 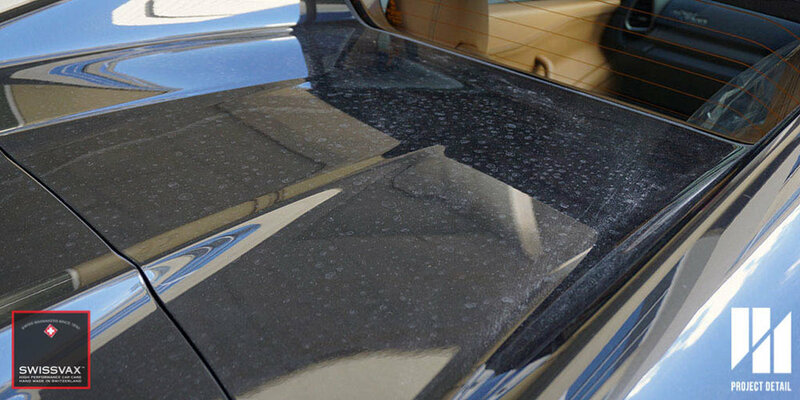 The owner of the vehicle was previously skeptical of the results of how a newly delivered vehicle could be improved found the paintwork to possess so much depth and clarity that the metallic flakes of the paintwork really stood out in the sun. This can be seen in the photo's show casing the paintwork. 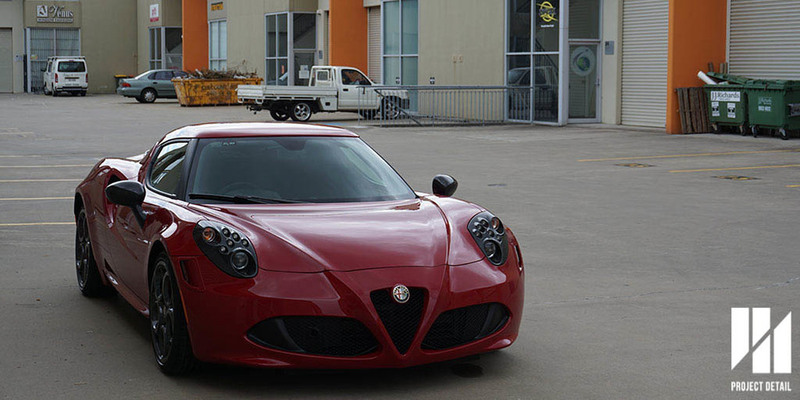 Project Detail Sydney was able to detail this beautiful Alfa Romeo 4C in red. The car was only picked up 6 months old coming in from Marrickville. The car was washed by the owners as careful as they could but using the wrong methods. 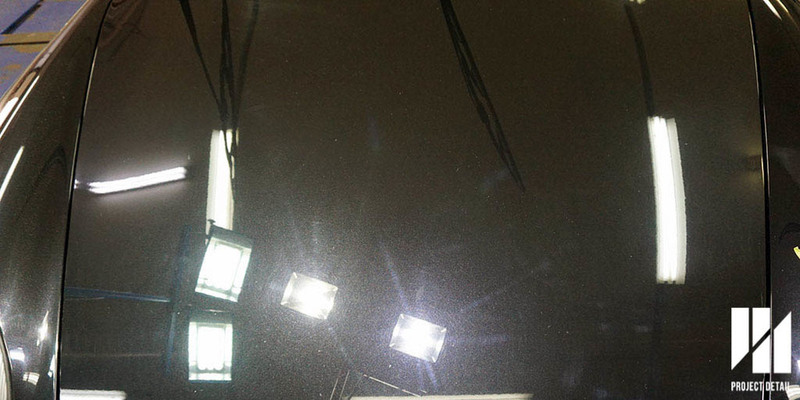 After our 21 stage wash and decontamination, these defects stood out under our LED inspection lights. What was even more shocking, was signs of damage from improper buffing and polishing courtesy of the dealership where the customer purchase their car. 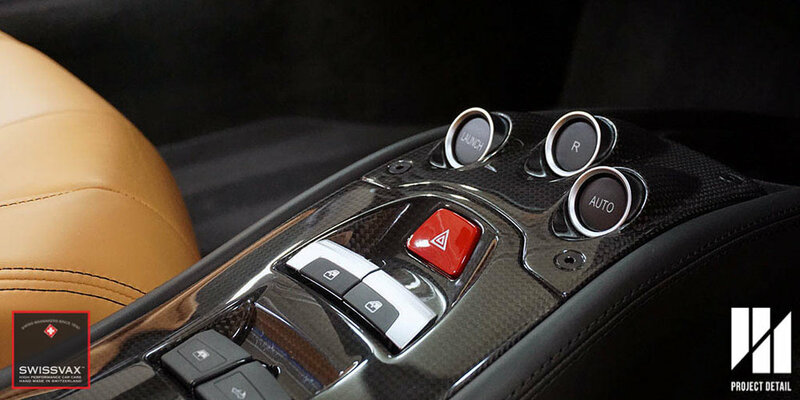 Extreme caution and expertise is required a vehicle comprising of mainly carbon fibre. The photo on the left shows 'burn' marks left from incorrectly buffing the door panels. While the photo on the right, show cases Project Detail's Stage 2 Paint Correction, with colour, richness and gloss returning to the paint. This Alfa Romeo 4C underwent Project Detail's Stage 2 Paint Correction to revise the paintwork. This had to be done painstakingly in order to avoid damaging the Carbon Fibre body of the vehicle. 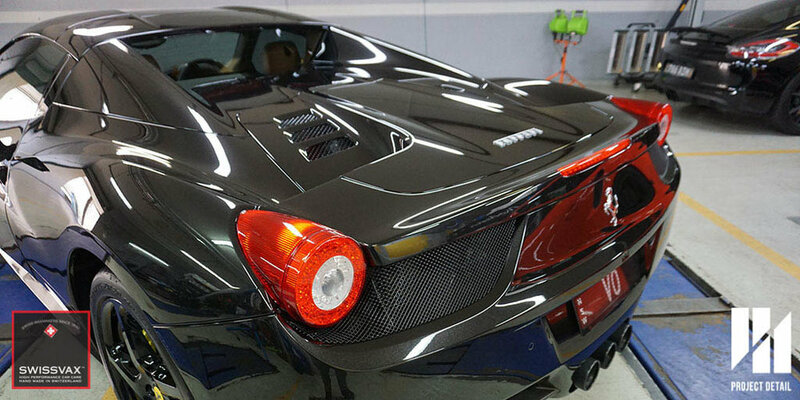 All the raw Carbon components of the vehicle were also polished. Once this correction was complete and we were happy with the vehicle, the paintwork was protected with two parts. 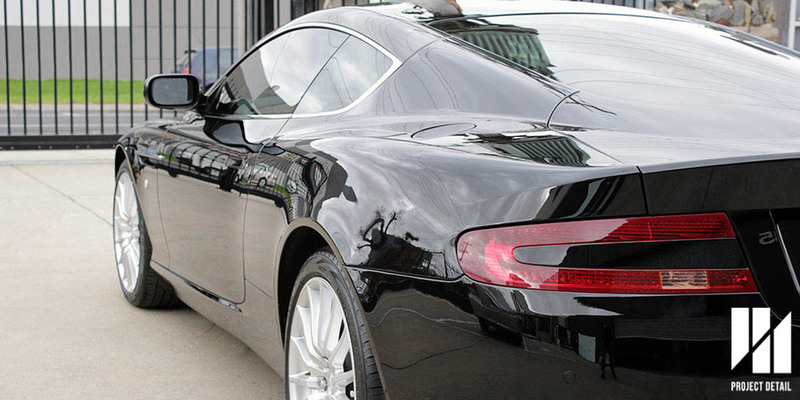 The entire body was coated with TAC System's Quartz Sparkle Glass Coating in order to provide a long term protection for the bodywork of the vehicle. 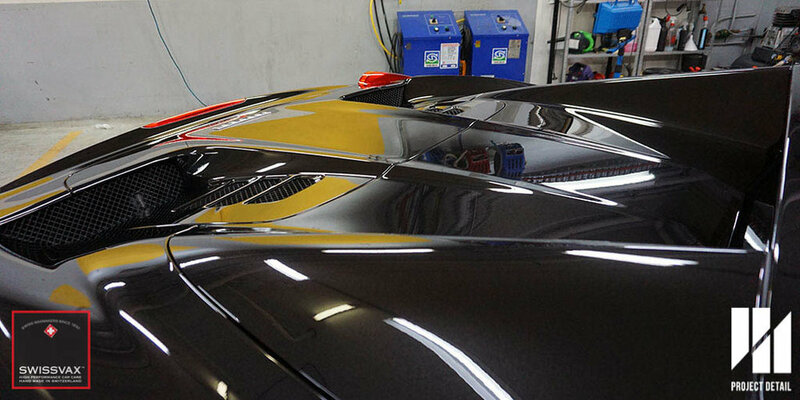 The front bar, front quarter panels and the bonnet were then protected with Suntek's Paint Protection Film. This provides a physical barrier to successfully protect against stone chips and other strong physical abrasions. Due to the complex design of the 4C's front bar, extra time was needed for a quality finish.